You've probably heard that the safety of neonicotinoid pesticides to bees is a matter of considerable controversy. However, neonicotinoids show varying toxicity to bees. Now, researchers reporting in the journal Current Biology on March 22 have new evidence in honeybees and bumble bees that helps to explain why bees differ in their sensitivity to different neonicotinoids. 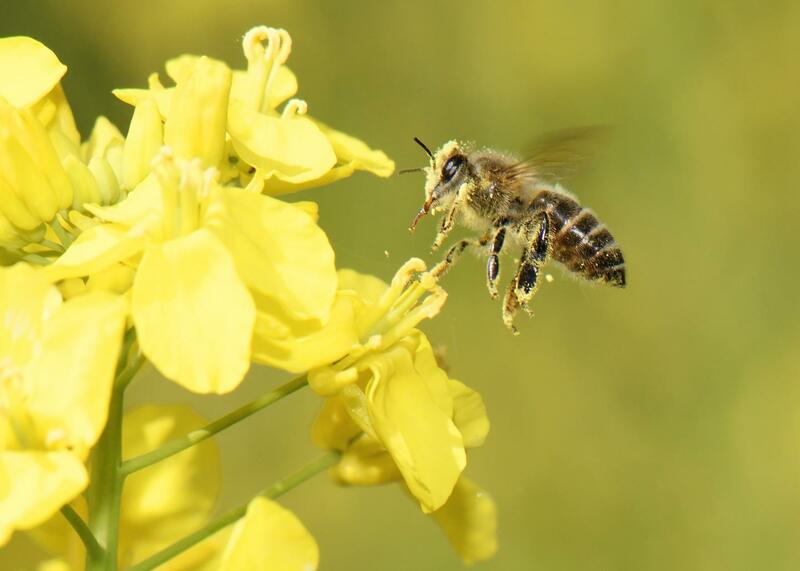 The study by researchers at Bayer AG (a company that manufactures neonicotinoid insecticides), the University of Exeter, and Rothamsted Research shows that differences in pesticide sensitivity result from differences in the way that metabolic enzymes involved in the bees' defense against toxins break down particular pesticide chemicals. The findings suggest that it may be possible to specifically design pesticides that are toxic to insect pests but not to bees, the researchers say. The study was supported with funds from Bayer AG. "Honeybees are more than 1,000 times less sensitive to the neonicotinoid thiacloprid than imidacloprid, with the latter classified as 'highly toxic' but the former categorized as only 'slightly toxic' or 'practically non-toxic' according to the official categories of the US Environmental Protection Agency," says Chris Bass from the University of Exeter, United Kingdom. "By utilizing genomic information and state-of-the-art molecular and biochemical techniques, we show that in both honeybees and bumble bees, this selectivity is determined by closely related enzymes, which rapidly break down thiacloprid before it impacts the bee nervous system. Those same enzymes have little to no capacity to break down imidacloprid–thus explaining the differences in bee sensitivity to these compounds." In the new study, the researchers, including Ralf Nauen and his bee toxicogenomics team from Bayer AG's Crop Science Division in Germany, first tested for differences in the way thiacloprid and imidacloprid bind to protein receptors in the bees' heads. Those studies showed no differences in receptor binding by the two pesticides. Differences in receptor binding weren't the answer. To explore potential differences in the way metabolic enzymes break down the two pesticides, the researchers first treated bees with a chemical known to block the function of P450 enzymes. Those studies showed that without working P450 enzymes, honeybees and bumble bees both grew much more sensitive to thiacloprid. The treatment didn't change their sensitivity to imidacloprid much, if at all. Studies conducted in cells in the lab suggested a link between differences in the honeybees' sensitivity and the function of a particular P450 enzyme called CYP9Q3. To provide additional evidence that CYP9Q3 is the primary honeybee P450 that confers tolerance to thiacloprid, the researchers engineered fruit flies to express various P450 enzymes from the honeybees and then tested their sensitivity to the pesticides. The studies confirmed that CYP9Q3 is the key enzyme. The researchers also found that bumble bees have a closely related P450 enzyme called CYP9Q4, which explains similar differences in their pesticide sensitivities. "We identified the same enzyme subfamily degrading thiacloprid in two different bee pollinator species, which raises hope that the mechanism is evolutionarily conserved among other bee pollinators," Lin Field of Rothamsted Research says. "We also found that these key enzymes are expressed at particularly high levels in Malpighian tubules–the insect equivalent of kidneys–and/or the brain where neonicotinoid insecticides act." The researchers say that simple screening assays could help to identify compounds or combinations of compounds that have a lower innate toxicity to bees early in development, to protect pollinator species and crops. The genetically modified fruit flies that they've developed can now also be used in studies to identify future insecticides that might be effective against pests and also readily broken down by bees. "It is frequently no longer sufficient to just demonstrate that new compounds are non-hazardous to bees; a mechanistic explanation must be sought for why they are non-hazardous," Nauen says. "Our study demonstrates for the first time that it is possible to mechanistically understand the low toxicity of certain pesticides to bee pollinators." This study received funding from Bayer AG, the European Research Council, and the Biotechnology and Biological Sciences Research Council.